Easy, economical, and great tasting, making your own homemade refried beans also adds nutrition to your plate for a great Mexican meal. Add some homemade canned salsa for even more real food goodness. These refried beans will soon become a family favorite side dish that kids can help make. 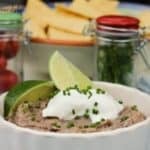 Homemade refried beans make the perfect side dish with Mexican food, stuffed right into your taco or burrito, or along with Mexican rice to look like a real Mexican restaurant. They’re a great way to gets the health benefits of beans during the summer months, too, when you’re not feeling like chili or bean soup. The store bought versions can have some sketchy ingredients like trans fats in them. I have had some luck with organic canned versions being clean of junk (Meijer brand, around $1 on sale — The fewer the ingredients, the better! ), but I prefer to make my own for budget reasons. Find this recipe, updated and with even more frugal tips and transformation options, along with 29 other bean recipes and a ton of information on cooking dry beans, the health benefits of beans, and ideas for bean haters in The Everything Beans Book! Soak the beans overnight (see here for details). Drain soaked beans, add fresh water, bring to a boil, reduce heat to a simmer and cook a few hours. Drain the cooked beans. Reserve the cooking liquid to thin the refried beans. In the pot or a large skillet, heat the remaining Tbs oil. Add the onions and cumin and cook over med-high heat, stirring occasionally, until the onions are limp, about 3 minutes. Add the garlic and oregano and cook, stirring frequently, until onions are lightly browned, 2-3 minutes more. Stir in 1 cup of the bean cooking liquid. Lower heat to medium and add half the beans. Use a potato masher or fork (or immersion blender) to mash them. Add remaining beans and mash. You can leave the mixture quite chunky, with some beans intact, or continue mashing until fairly smooth. Stir well and make sure the beans are thoroughly heated. When most of the liquid has been absorbed, turn off the heat. Stir in the cheese, 2 Tbs. lime juice, lime zest, and salt to taste. Add more lime juice, if needed, to create a citrus edge. Serve hot, with a sprinkling of grated cheese. -Add 1 tsp. chili powder when you add garlic and oregano. -Use sharp cheddar or feta instead of jalapeno Jack. -Stir in ½ c. thinly sliced scallion greens when you add cheese. -Do as the Mexicans do and garnish with chopped radish. * Cook at least a whole pound of beans and freeze the extra for later. You can cook the beans traditionally and use about 3 ½ c. cooked beans for this recipe. 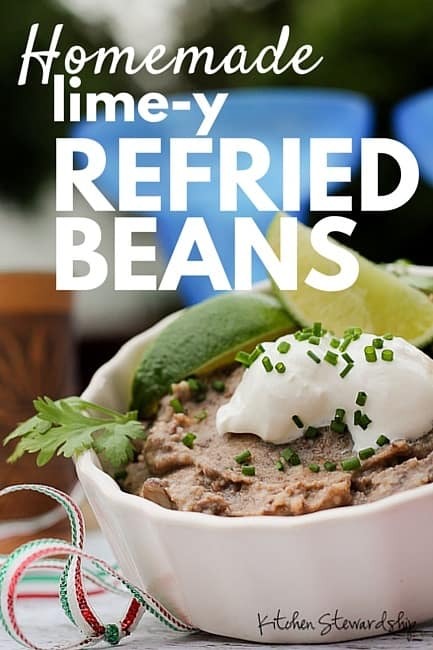 * The refried beansthemselves freeze excellently – I freeze in ice cube trays, dump bean-cubes into a Ziploc, and heat what I need for a Mexican dish or side with tacos. I often make a double batch! * Try pressure cooking for an easy alternative and quicker method when you’re pinched for time! Compared to canned refried beans, this recipe makes about 2-3 cans worth — a great deal! Think it’s too much work to make refried beans AND do all the other dinner prep? Let your kids help! From soaking to cooking to blending, kids really can learn to make these from start to finish…all on their own! 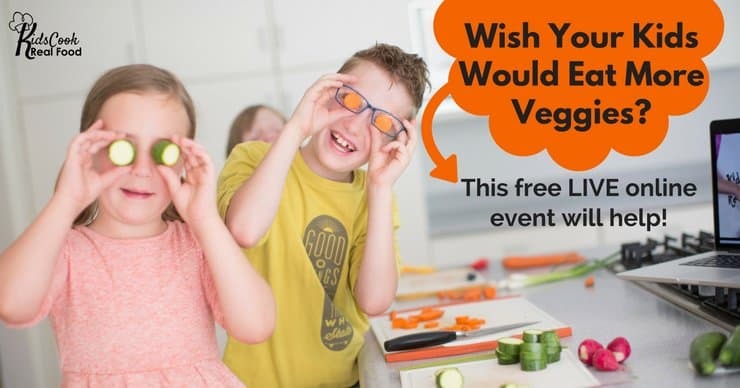 Katie here, just interrupting for a sec if I may with an exciting announcement about something I’m super passionate about… I just love talking about how to get kids to eat healthy foods – withOUT the power struggles and dinnertime madness I know happens in a lot of families!!! 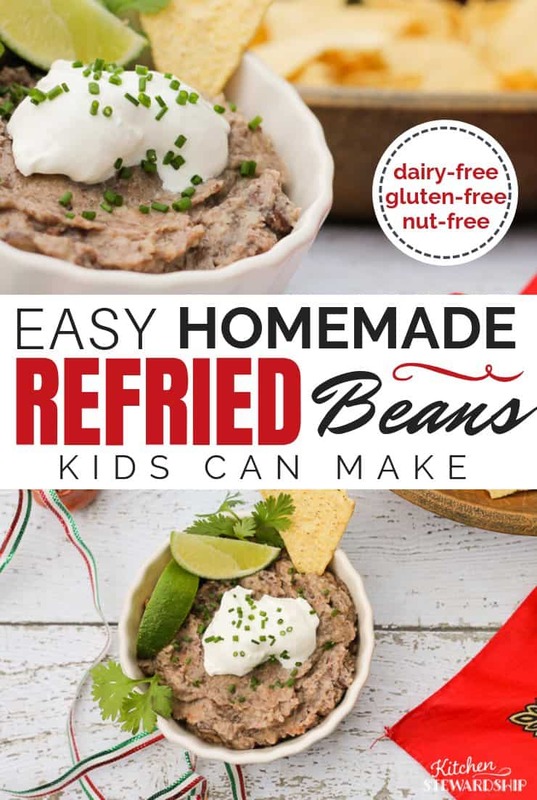 « Previous Post How to Cook Dry Beans: Simple Steps Even Kids Can Follow! This is one thing I have not yet made ahead and frozen. I am definitely going to have to try your recipe! .-= Kara´s last blog ..The Best Chocolate Chip Cookies. Ever. Really. =-. 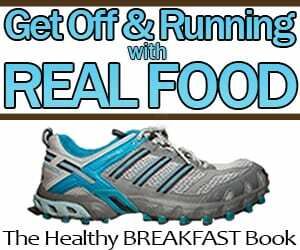 .-= SnoWhite´s last blog ..Healthy Tailgate Foods =-. That sounds so wonderful! I will definitely try it! .-= Hallee´s last blog ..Virtues: The Pleasure of Purity =-. I’ve never had refried beans. Do you eat them as is? With tortillas? Any other ideas? .-= cooking manager´s last blog ..Friday Roundup #15 and Two Carnivals =-. Yes and yes! A lot of people put a plop of them on the plate alongside another dish, usually Mexican style, often with rice as well. They also go great inside a tortilla, either by themselves, with cheese melted as a quesadilla, or as an addition to tacos. Eat with chips as a dip or as part of nachos. We even put leftovers on a pizza once, with peppers, salsa and cheese – super yummy! Hi! If you want to make up several jars, do you know how long the jars need to be processed in the pressure canner? .-= klutzymama´s last blog ..Baseball Helmets And Your Brains =-. I’ve never pressure canned anything, actually, but from my forays into canning this summer, I don’t think I’d can anything that wasn’t a “canning” recipe. I freeze these in serving size portions though – just put a few tubs in the freezer today! 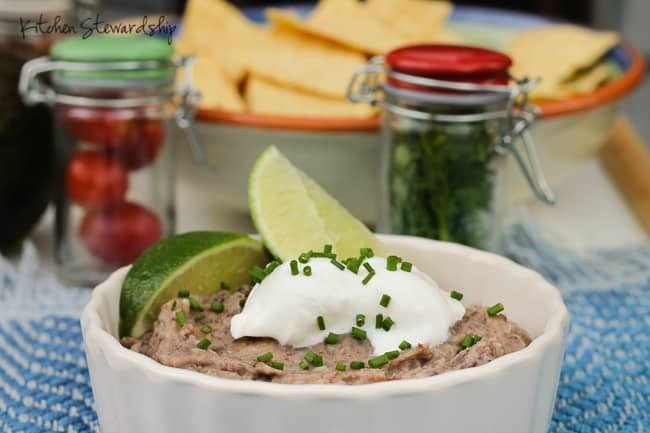 I just wanted to share one of our favorite uses for refried beans. I add tomato sauce (about 1/4 to 1/2 of the amount of beans) and taco seasoning to taste to make a quick snack-type chip dip. We also use it as a meal by also adding diced chicken and brown rice. We often make cheese nachos and dip them in the bean dip. Different people in our family add things like cheese, sour cream, jalapenos, cilantro, etc at the table. I’m planning to try this recipe for the first time in the next day or two. But, I have a question, I’m a little confused about the recipe if you don’t use a pressure cooker, do you only soak the beans overnight and not actually cook them? Or do you soak them overnight, and then cook them for an hour or two like you would if you were using them in place of canned beans, and then continue with the recipe? I’m kind of assuming that you have to cook them, but the recipe just says, “Drain the soaked beans”, so I don’t want to cook them if I’m not supposed to. Yikes – sounds like I better edit that post. Yes, you cook the beans until they are done! Drain soaked beans, add new water, bring to a boil for 10 minutes and cook a few hours. Enjoy! One of my favorite things to make is homemade black beans and turning them into homemade refried beans. I mostly follow Rick Bayless’ method/recipe which is so delicious! He keeps things pretty simple, as you just cook the beans initially with some onion, oil and salt, although one of the things he recommends as an optional ingredient is adding toasted advocado leaves in with the beans while they are cooking, and wow, they were amazing when I tried that. Then, when making the refried beans, you just start with some additional fat (lard/oil), some minced garlic and then the beans. Simple, but really oh so great! To me, there is no comparison in flavor between these and store-bought refried beans, which I never really cared for very much. I’m wishing it was taco night after reading your comment! Mmmmm… Welcome to KS! Where do you get avocado leaves, presuming they aren’t growing in your back yard? It sounds wonderful but I have never even heard of using them in cooking. Hi Beth-I actually got mine thru gourmetsleuth.com, but if you have a good Mexican grocery store in your area, I’m sure you could find them there as well. Obviously, they are dried (kind of like bay leaves), and you’ll want to toast them lightly before using them (just put them in a dry skillet over medium heat for a few minutes, until fragrant). Also, you’ll want to remove them once the beans are finished cooking. Hope this helps! I know traditional refried bean recipes use lard to cook them in, I want to do it that way, but I can’t find non-hydrogenated lard out there. Anyone have any secret sources I haven’t heard about. I really don’t feel up to rendering my own at this point. I have heard of people using bacon fat drippings to make refried beans. I personally don’t use it, but it may be an option for you. Where I live, we eat refried beans with everything. Restaurants use lard, but cooks here fry in bacon grease. It tastes better than lard. If you have to put your beans in a blender, they are not cooked enough. Cook a little longer and you should be able to mash them with a potato masher or a spoon. The more garlic you use when cooking the beans, the less gas you will have when you eat them. Don’t put any oil in the beans when you cook them, you don’t need it. If you have any soft tomatoes you need to get rid of, throw them in the beans while they are cooking. For a but of a kick, add a Serrano chile OR a can of Rotel tomatoes and green chiles. If you like the freshness cilantro brings, add it in the last 20 minutes of cooking. Also, what can you use the liquid drained from the beans for? I made beans yesterday, and there was a lot of liquid! I put quite a bit in with beans for 2 dinners this week (yeah me!) and froze 2 glass jars full of it… just not sure what to do with the jars of liquid! The BEST refried beans! Thanks for the recipe!